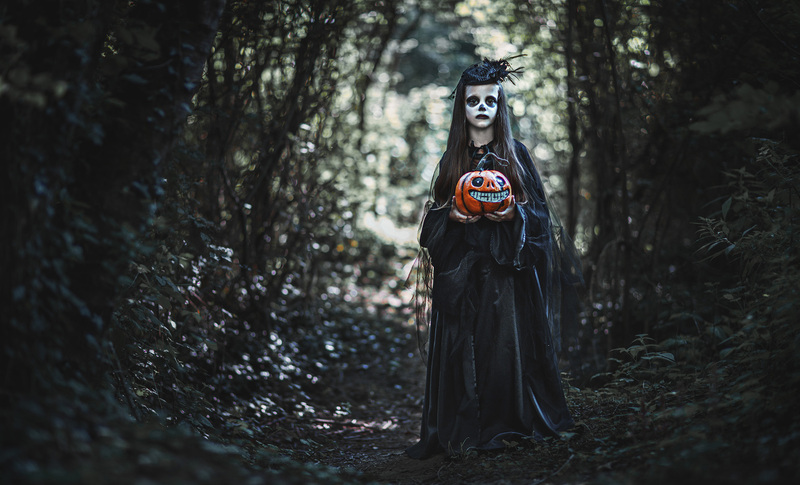 Halloween is right around the corner, and what a great holiday for photographic inspiration: From cute kids in costumes to spooky haunted houses; eerie glowing jack-o’-lanterns to pastoral pumpkin patches – Halloween offers an endless variety of unique subjects. Much of what defines the spooky quality of Halloween tends to be in the dark, whether indoors or outdoors. Typically, this is where flash photography can come in handy. However, the bright light of a flash may not work here. In fact, this might be one holiday when it’s better NOT to use a flash in a dark scene. The higher your camera’s ISO, the greater its sensitivity to light. Maximum ISOs on current EOS cameras can be anywhere from ISO 6400 or above. In low light, try settings like ISO 1600, 3200, and higher depending on how dark the scene is. Working with higher ISO levels does result in increased noise or grain in your image but don't be afraid of pushing the limits of your camera. Fortunately, modern digital SLRs offer very effective High ISO Noise Reduction technology. This can even be adjusted on most recent Canon EOS cameras, allowing different levels of noise control, including (on some cameras) a powerful Multi-Shot Noise Reduction option. Wide apertures are identified by their lower f-stop values, for example: f/1.2, f/1.4, f/1.8, f/2.0, f/2.8. At these f-stops, more light is entering the lens through its larger aperture opening. Try to shoot at the lowest f-stop your lens will allow and the image will be brighter, without resorting to flash use. Lenses like Canon’s extremely affordable EF 50mm f/1.8 lens are an excellent way to get started in available-light photography. Be aware that wider apertures/lower f-stops also result in shallow depth of field within your images. That means your subject will be sharp against a blurry background and foreground. Therefore, critical focus is more important at lower f-stops. Unfortunately, that can be even more challenging in dim lighting – so double check your image focus by zooming in on the camera’s LCD after each shot, or whenever possible. Shutter speed is measured in fractions of seconds, but can also be set to last several seconds, minutes, or even hours. Slower, or longer, shutter speeds let more light into the camera – resulting in a brighter image, with no flash. However, slow shutter speeds also result in potentially increased image blur – both from subject and photographer movement. While you can't necessarily control subject movement, there are ways to minimize blur from your own movement handling the camera. When shooting handheld, your slowest 'safe' (blur-free) shutter speed should closely match your lens focal length, literally: A 16mm wide-angle lens only needs about 1/15th sec. ; a 50mm lens needs about 1/60th sec. ; a 200mm telephoto needs a much faster speed of 1/200th sec. ; and an 800mm super telephoto lens requires at least 1/800th sec. shutter speed. If you follow that general pattern, your images should not have blur from photographer movement. You also have Canon's Optical Image Stabilization on your side -- assuming you have an Image Stabilized (IS) lens. These lenses are very forgiving; each IS lens gives you up to five full stops of stabilization (depending on the lens) meaning you can use slower shutter speeds than recommended using the formula above. With IS turned on, you can shoot with that 200mm telephoto at 1/60th or even 1/30th sec. shutter speed with little or no blur caused by photographer movement. Keep in mind that Image Stabilization will not reduce subject movement, just the photographer. Another way to minimize blur with long exposures is to shoot with a tripod. This will eliminate blur caused by photographer movement with any lens, at any shutter speed (however, moving subjects may still be blurry). If you don’t have a tripod, fake it: Set your camera on a stable surface, or prop it on something while shooting such as a fence post, mailbox, table, or whatever is handy, flat, stable, and the right height for what you need. Pumpkin patches are a perfect place for a family portrait. It’s a great way to use background details to create a sense of time and place that will give your photos context. Look for the details – in costumes, decorations, bags of candy, etc – that help capture the spirit of the Halloween season. Try B&W, sepia, or other types of tinted photography for a unique look. This may be adjusted in-camera through the EOS Picture Style settings, or you can create the effect while editing your images in Digital Photo Professional (or your preferred image editing software). Experiment with lighting. For example: Use red ‘party’ bulbs for unique room lighting; or try lighting your costumed friends and family with flashlights (the under-the-chin flashlight angle works especially well for a scary portrait effect!). Time Lapse movie mode is another cool one to consider. It shoots video at much lower frames-per-second rates and resulting videos show the passage of time much faster. Some compact Canon PowerShot and EOS SLR digital cameras offer this built-in. 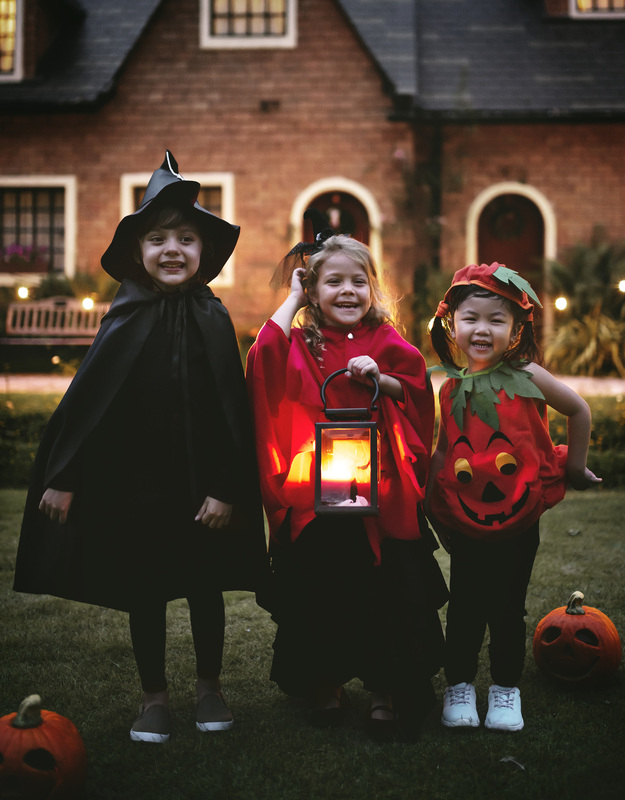 If you have this feature, set the camera on a tripod and try to capture some fun time lapse videos: a child changing into their full costume; carving pumpkins; an evening’s worth of trick-or-treaters grabbing candy from a bowl; or whatever other activities you can think of. Direct flash will completely overwhelm your jack-o’-lantern. Turn it off, and use the low light shooting described techniques above. If you have a tripod handy, the long exposure/slow shutter speed will work very well – mainly, because there is no chance of subject movement causing image blur (unless your pumpkin rolls off the table!). If you absolutely need additional light from a flash, dial the Flash Exposure down a stop or two. This is possible on most Canon Speedlites; you can also adjust Flash Exposure for EOS and PowerShot built-in flashes, using the Flash +/- settings in camera. After reducing the flash output, if you’re using an accessory Speedlite with bounce capability, try bouncing your flash by redirecting the flash head to a wall or ceiling. Or, if you can’t swivel the flash head (such as with a built-in flash), then consider diffusing it with a small sheet of wax paper or a scrap of thin white fabric. Bouncing, or diffusing the flash will soften and reduce its light output, adding to the exposure without overwhelming the scene. You may have to experiment with different bounce angles, diffusion materials, and exposure levels before finding just the right combination. If you're unsure about the best practices for bounce flash, take a look at the new 470EX-AI Speedlite. This flash assesses the room you are in and automatically adjusts the bounce angle, without any input from the photographer. If the flash determines there are no opportunities for effective bounce flash, like outside for example, it will default to the straight-ahead angle. It's quite ingenious! 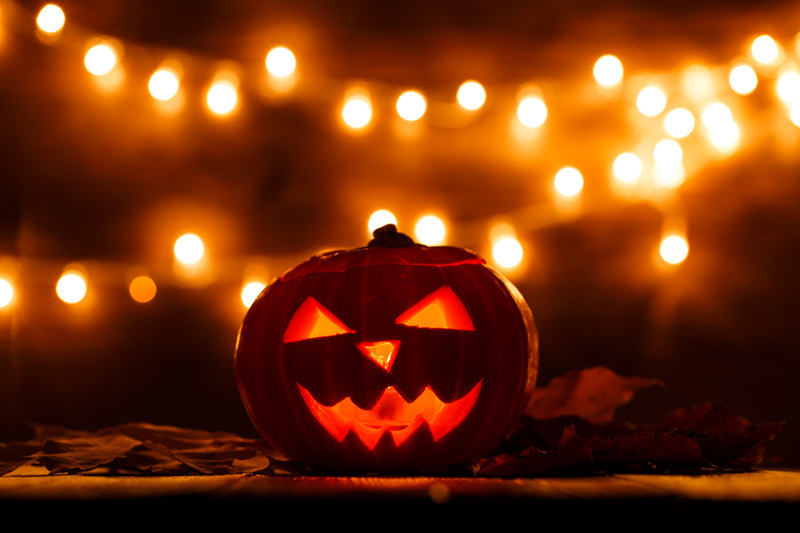 The ideal jack-o’-lantern photograph shows the inner glow of the candles, as well as the carved pumpkin face – which means a careful balance of trying not to overexpose the candles, or underexpose the outside of the pumpkin so much that you lose all detail. Start with the candles: Put multiple candles in the pumpkin cavity to add as much ‘glow’ as possible. Use the spot, or partial spot, exposure metering option in your camera (indicated by a single dot, or circle, in the center of the Exposure Meter Icon), aimed directly on the glowing candles – this will help prevent them from overexposing. You can lock in this exposure reading by pressing the AE Lock button (the asterisk icon on back of your camera) or switch to Manual exposure (M) mode, dial-in the speed and aperture that indicate proper exposure from the Spot reading and leave exposure set there. For the rest of the scene, try lighting the outside of the pumpkin with a warm, soft light source that will match the feel of the candles. A low-wattage lamp with a shade; a heavily diffused flash (try putting a piece of red, orange, or yellow colored gel/cellophane in front of the flash for added warmth); a string of Christmas lights; or even other candles – these are all great ways to add just enough light so you will see detail on the outside of your pumpkin without over-powering the glow of the candles within. If possible, consider bracketing your exposures. This means taking multiple shots of the same scene, each at a different exposure level. If you're in the P, Tv, Av, or even M shooting modes, all EOS DSLRs allow you to do this simply and effectively with Auto Exposure Bracketing -- AEB. It's usually in the red Shooting Menu. With AEB, the camera takes three separate shots, one at normal exposure, and the others intentionally over- and under-exposed. You pre-define how far over and under these are, in the AEB setting menu. Current EOS cameras usually allow you to vary exposure up to two or three stops from "normal." And, some high-end EOS models allow you to take as many as seven automatically bracketed exposures. But even with three shots to pick from, one will usually have the right balance of highlights and shadows you're looking for. As you see, the tips for great Halloween photographs are pretty simple. Really, it all comes down to two key elements: variety and specificity. 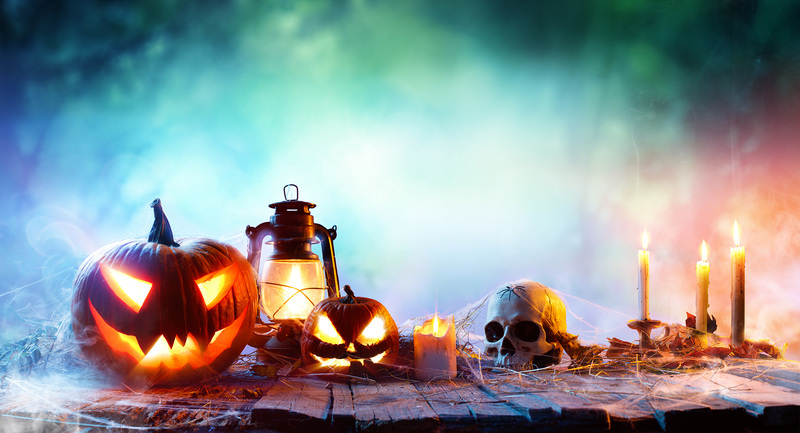 In other words, there are a lot of different activities and subjects to capture in this holiday that is at once playful, cute, scary, spooky, comforting, and odd. However, because each subject may have a different mood, you will get the best results with a specific goal in mind as to the look/feel of each new image. Challenge yourself to set a mood – whether through lighting, use of colors, or framing and composition. Halloween is a great holiday for experimenting, so shoot it all, and look for as many unique points-of-view as possible!